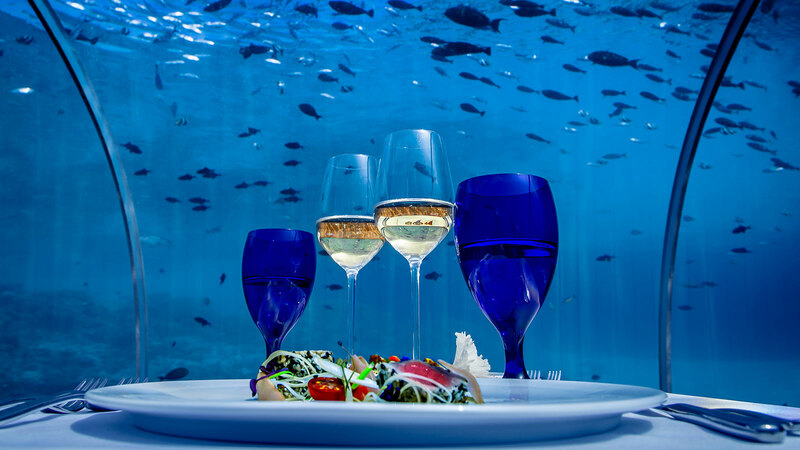 The Maldives is set to become home to the world’s largest underwater restaurant, with the opening of a luxury, five-star, adults-only resort. When the Hurawalhi Island Resort opens in November, one of its star attractions will be the “5.8” undersea restaurant named after its watery location: the unusual dining destination is set 18 feet below the lagoon. The restaurant, which seats up to 16 guests, will allow diners to take in their marine surroundings through a transparent, domed ceiling as they tuck into a multi-course tasting menu. To enter the restaurant, guests enter a little hut and climb down a spiral staircase. Overseeing the resort’s cuisine is executive chef Shannon Batten, a New Zealander who has cooked for Bill Clinton, the British royals, Rod Stewart, Bob Geldof, Neil Young, the Rolling Stones, and foreign heads of state. The resort features 90 villas that come with modern conveniences like king-size beds, air conditioning, internet access, private porches and flat screen TVs. Hurawalhi Island Resort and Spa is located in the Lhaviyani Atoll and opens in November.